Pets love the energy from these magnetic pads! Just like the regular bed pads, these are available in Classic (5-Gauss field) or Core (10-Gauss field). The pet pads also come in two thicknesses. 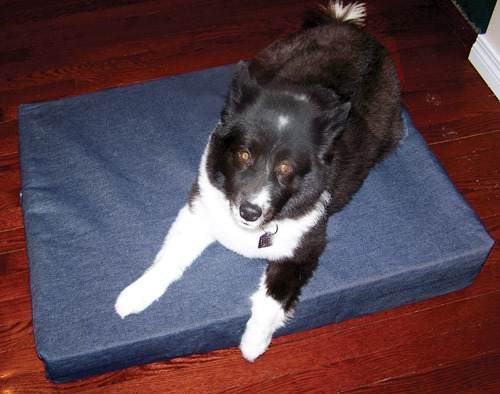 The 1 3/8" pads should be placed underneath the dog’s regular bed. The 3 3/8" pads can be used alone and have foam on top of the magnet core. All pads have a removable, washable denim cover. Click here for a full description of Magnetico mattress pads. Below are the standard sizes; custom sizes are available. If you have specific size requirements, call or e-mail us for pricing. Shipping varies by pad weight and shipping location; call for quotes. Magnetico imposes a 10 percent restocking fee on returns.